Either by choice or circumstances, many people, especially women, may find themselves having to manage financially on one income. According to a U.S. Census report, approximately 45% of adults were single, divorced, or widowed in 2016. And of those, more than half were women. Additionally, around 30% of married mothers are stay-at-home parents, according to the Bureau of Labor Statistics. A single-income lifestyle has its challenges, but it is possible to thrive financially with some planning and a little creativity. Here are a few tips to help you get started. Every dollar counts when you’re a single-income household. Making a budget can be a good way to get a clearer picture of your financial situation and where your money’s going. It also helps you stay on track; you may be more likely to stick to your plan if it’s written down. The first step is to list your monthly income. This not only includes your salary, but also any money you may get from other sources, such as alimony, Social Security, or dividends. From your income, you’ll want to subtract your expenses. To help make sure you don’t forget any, you may want to track your spending for a month. You might also want to separate your living expenses, such as groceries and housing, from your discretionary costs. This way you can see how much it takes to run your household. You’ll also want to subtract any funds you have earmarked for your short- and long-term savings goals and retirement accounts. For example, perhaps you’re saving $100 a month for a down payment on a car or to contribute to an IRA. Any money left over could be put toward other savings goals or used to pay down debt. If you have a deficit, you’ll most likely want to take a closer look at the expenses. Generally speaking, when making a budget, it’s better to reduce your costs and leave your savings and retirement accounts alone. Paying down debt. High-interest credit cards, mortgages, and student loans can put a strain on your finances. Consider using any money you save from trimming expenses to make extra payments. The faster you pay down your obligations, the more money you may save in interest, which could be put toward your retirement or another goal. Shopping around for the best deal. You may be able to get the same TV, Internet, or cell phone services at a lower cost. Check with your current provider first, as they might be willing to negotiate to keep your business. Using coupons and rewards programs. Coupons offer instant savings, and although the amounts may be small, they can add up over time. Rewards programs are an easy way to save more through special deals, or perhaps even get items for free. Fighting temptation. There’s nothing wrong with splurging once in a while, but it’s important to keep impulse shopping in check. Consider waiting a day or two before making a purchase to see if the urge disappears. More often than not, it probably will. On occasion, you may need to put some of your savings goals on hold to address more immediate financial needs. Even so, you should strive to keep funding your emergency and retirement accounts. Both are essential for pursuing financial security. One way to do this might be to set up automatic transfers from your checking account or paycheck to your rainy-day fund. With automatic deposits, you may be less likely to miss the money. Plus, you’ll be better prepared for any unforeseen expenses. Once you’re comfortable with the amount in your emergency account, you could then look for other ways to invest your money. The same approach may also work for your IRA. Additionally, if you participate in a 401(k) plan, consider contributing enough to receive any matching employer contributions. The match is “free” money that can potentially bolster your retirement savings. Stay-at-home parents can also invest for their futures through spousal IRAs (IRAs for non-working spouses). Due to their longer life expectancies, women should try to save as much as possible. They’re more likely to have only one income later in life. A common misconception is that living on one income means doing without, but that’s not necessarily true. With a little creativity, you may be able to get and do the things you want. Garage sales and flea markets are potential treasure troves of furniture, clothes, and toys at bargain prices. You may be able to refurbish or refinish items cheaper than buying them new. Most cities and towns offer many activities at little to no cost, such as free museum days, concerts in the park, and festivals. Libraries are another good resource; many have programs for children and adults that go well beyond book discussions. If your schedule permits, you might consider getting a part-time job to supplement your income. This money could be used for a variety of purposes: bills, savings goals, debts, or discretionary purchases. In this gig economy, there are more flexible job opportunities than ever before, such as freelancing and ride sharing. Or you could look for something more traditional, such as working in a retail store or babysitting kids in your home. Most importantly, embrace your single-income lifestyle—whether you’ve never married, are newly single, or have chosen to be a stay-at-home parent. 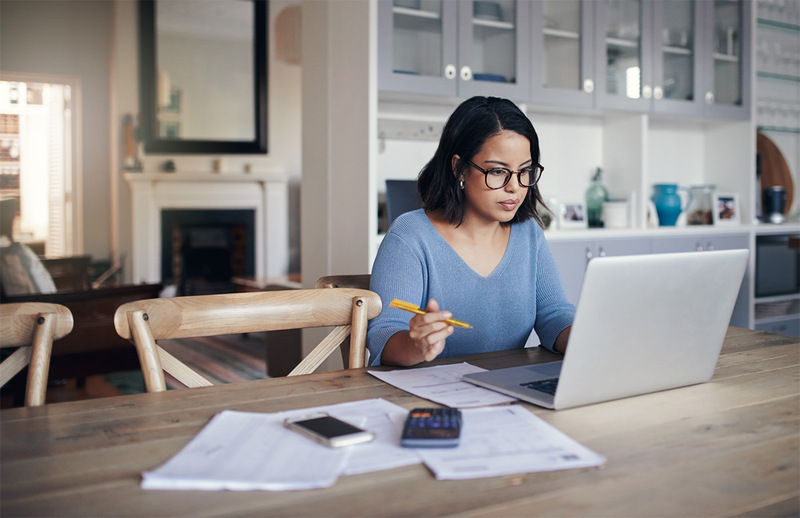 Armed with a plan, it's possible to effectively manage your one-income budget, pursue your savings goals, and move forward on the path toward financial well-being. To get additional guidance tailored to your situation, call TD Ameritrade at 800-454-9272 or visit one of the local branches. Plan for tomorrow by setting financial goals today. Payment of stock dividends is not guaranteed and dividends may be discontinued. The underlying common stock is subject to market and business risks including insolvency.